Q: Is there a difference of cost between standing and flying? A: No. All poses are the same cost. Q: The bills of my birds are damaged, is this a problem? A: No, we use artificial bills on all waterfowl and game birds. Q: What about turkey heads, are those artificial as well? A: No, we use only the finest freeze dried turkey heads to capture the extensive details of the bird. Q: How do I know which bird to save for mounting? What makes a good trophy mount? A: The best birds for taxidermy are generally more mature, late season birds. All birds grow new plumage for the winter, not only to have good warmth, but, primarily, the males and females become more beautiful to find mates for spring. The later in the winter season, the better the possibility that the bird you have collected is in mint condition. But the bottom line is if you shoot a bird that you think would make a great mount, it probably will. Q: When choosing between multiple birds that look similar, which one should I choose? A: Avoid birds with pin feathers. These feathers are common on waterfowl until mid-December and will fall out during the mounting process. If possible, try and avoid birds with broken wings when choosing a flying pose. Also, avoid birds with multiple broken feathers and/or a lot of feather loss as they cannot be replaced. Q: Can I have my bird mounted on a unique base? A: Yes. Your bird can be mounted on any type of base or habitat for an extra charge. The standard fee includes a piece of weathered driftwood. 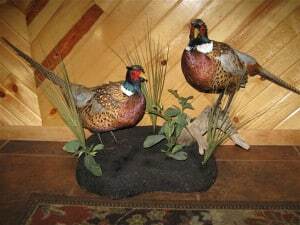 We have mounted many birds with custom bases, from a water scene with artificial water and marsh grass, a pheasant standing proudly atop an old wagon wheel or fence post, or a wood duck hen peering out a knot hole while the drake stands guard above her. A: Prices vary according to the species and any extras such as panels, driftwood, background or the habitat involved.